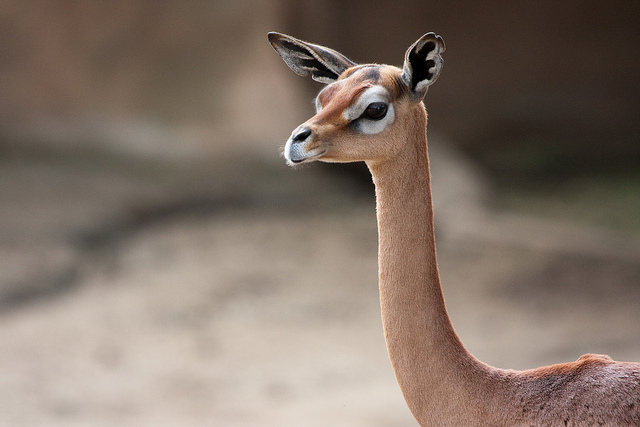 With large eyes and ears and an incredibly slender neck, you may be forgiven for thinking that the Giraffe-necked Antelope was actually thought up in the Disney Studio rather than occurring in the wild steppes of East Africa. 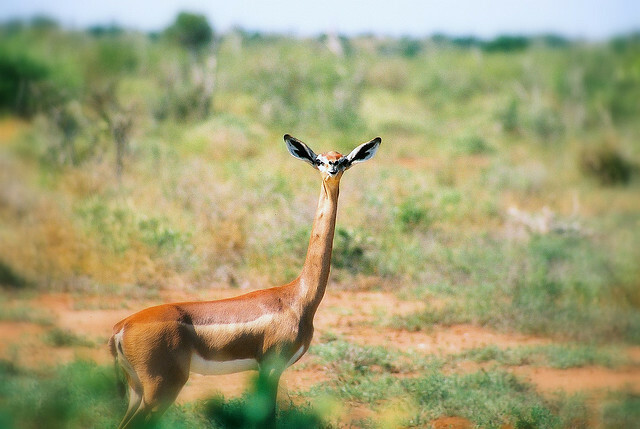 This unusual and elegant beast is a great survivor – and it possibly owes its continued existence to its wonderfully long neck. 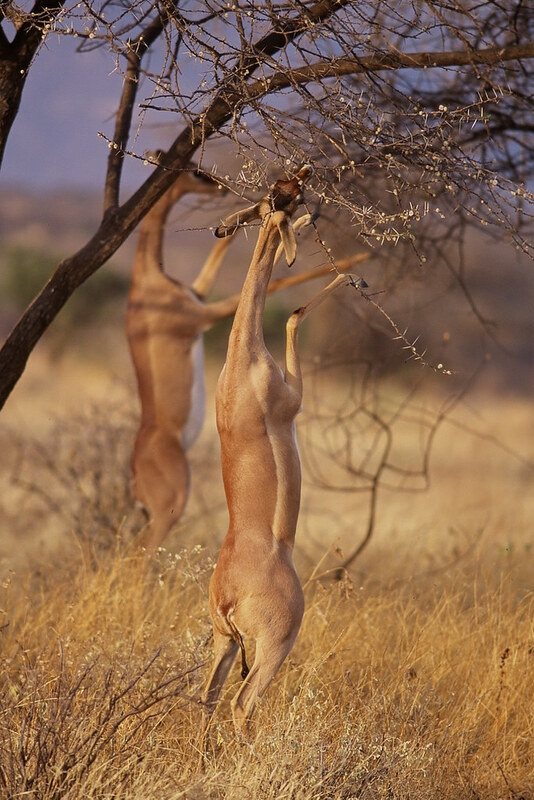 When you realize how high the animals stretches in order to feed, you can imagine many an African folk-story being handed down through the generations to explain how it came to get that way. 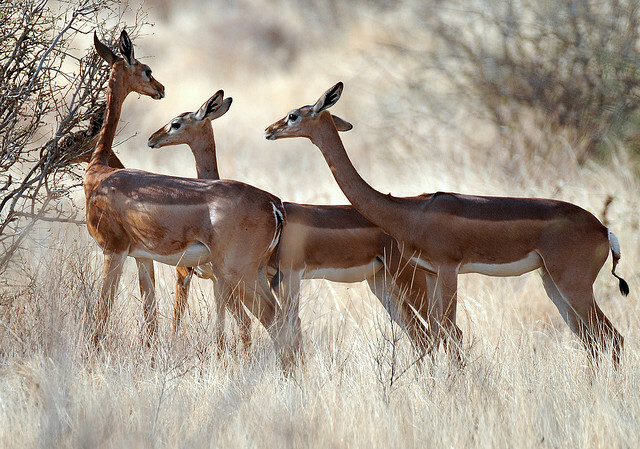 The animal comes under a number of names – including the wonderful sounding Gerenuk. 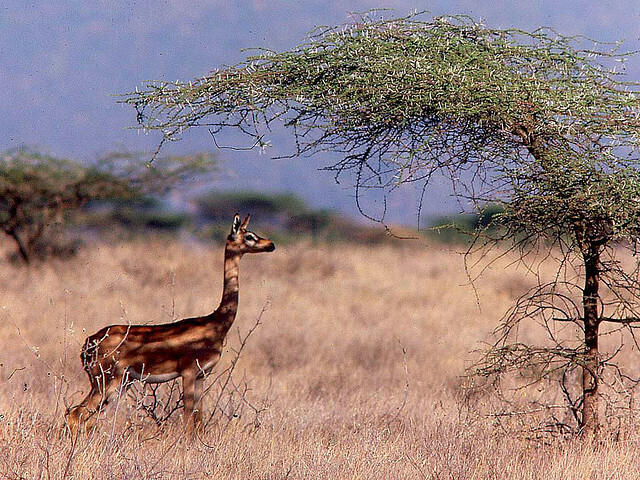 This is from the Somali language and literally means ‘neck like a giraffe’ and this is reflected in its English name. 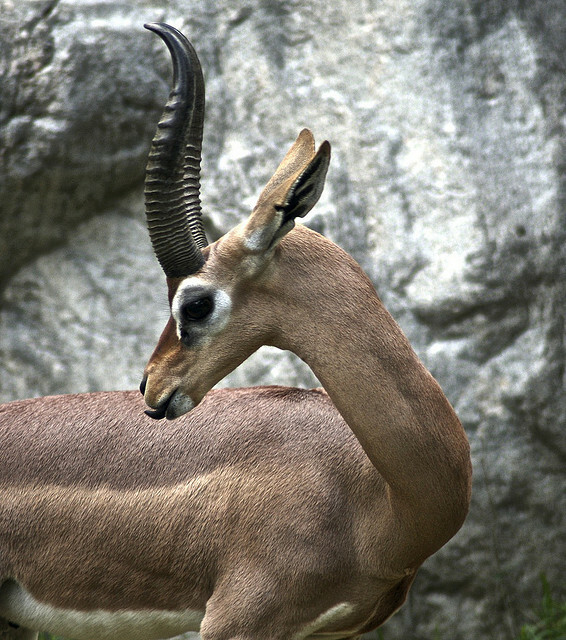 The alternative is Waller’s Gazelle, named after the European who first classified the graceful looking animal. Its Latin name is Litocranius walleri and as such is the only species in its genus, although there are two sub-species. In other words, it is effectively all alone in the world, unique but sadly under threat like so many other large mammals in Africa. 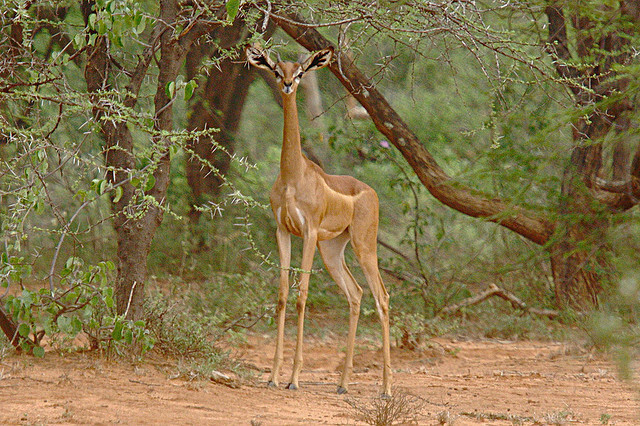 Possibly the main characteristic that gives the Giraffe-necked Antelope its rather strange cartoonish appearance is the fact it has such a small head. 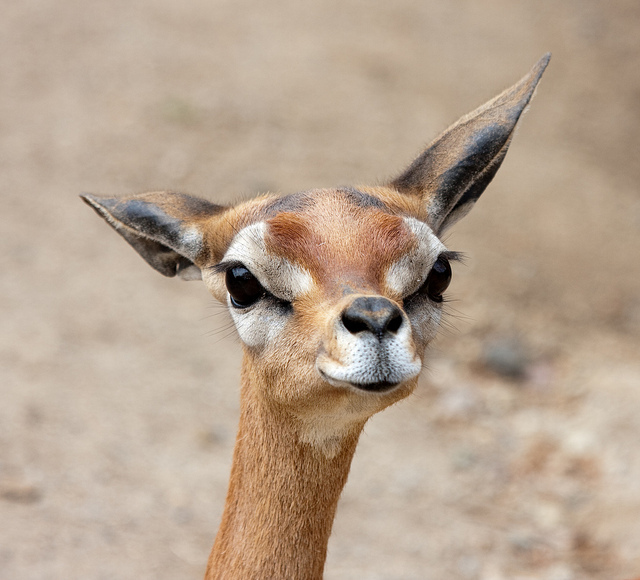 It is because of this rather petit cranium that its eyes and ears seem to appear so exaggeratedly large but rather than make the animal seem foolishly overdrawn (as it were, it adds to its appeal). 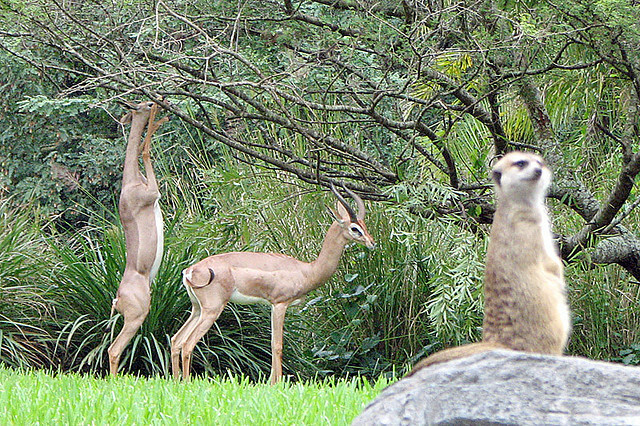 They are about a meter in height usually, but when they go foraging for food this changes drastically. 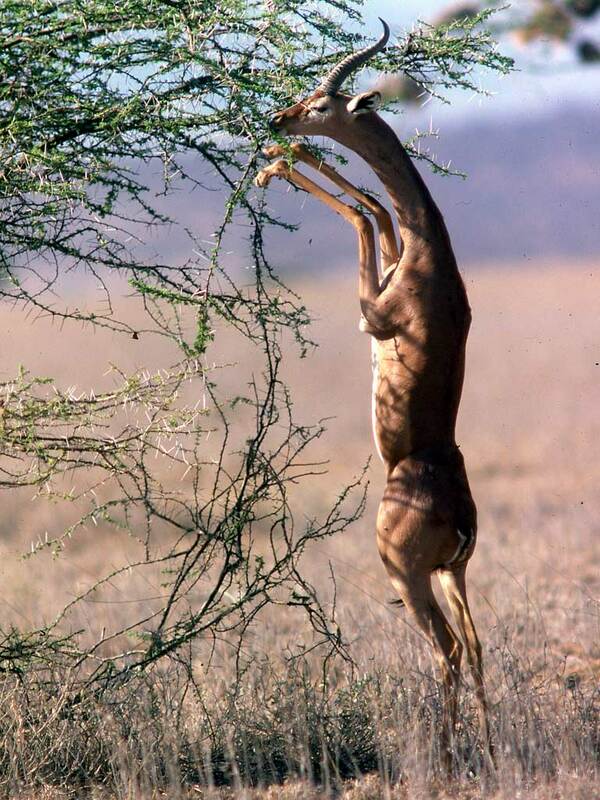 For the GNA (as we shall call it) often feeds on its hind legs. It is here that thousands and thousands of generations of evolution and breeding comes to the fore and the reason for its long neck becomes suddenly apparent. Go for it, girls. 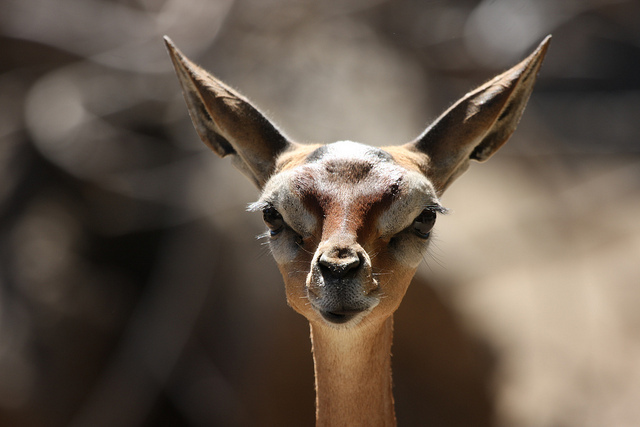 Like the byline of a certain beer, the GNA can reach the places that other antelopes simply don’t. This has given them a distinct advantage in the arid areas which they inhabit. They live in small groups – mostly consisting of females related to each other – and of course their young. 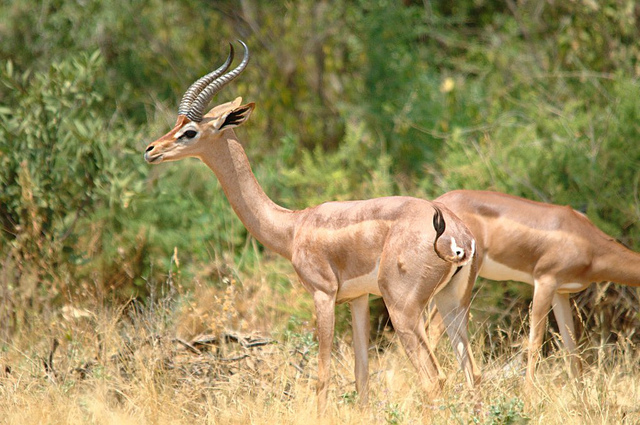 They also live in bachelor groups too, although many of the males chose to live solitary lives. You could also mistake them, in the right light, with certain extra-terrestrials from any number of TV series, such as the X-Files. 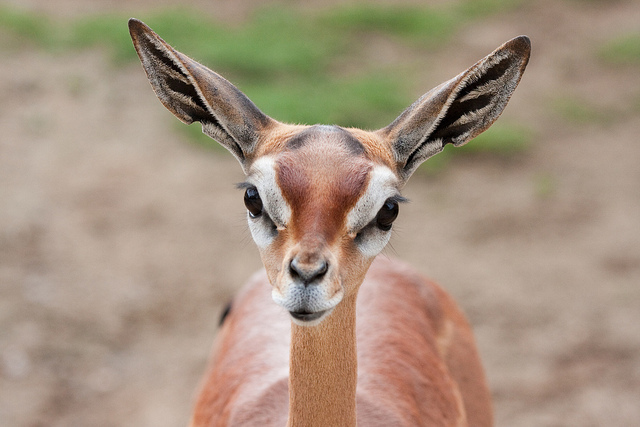 The GNA, however, is right down to earth, even though it does look like a cross between ET and an antelope. When a male lives on his own they are generally thought to be territorial. However, their ranges are so large that scientists have yet to be able to say how – or even if – they would defend their territories. Certainly the word magnificent does not immediately spring to mind – these are docile looking animals. But a look at the head of a young male, close up, may well change your mind. 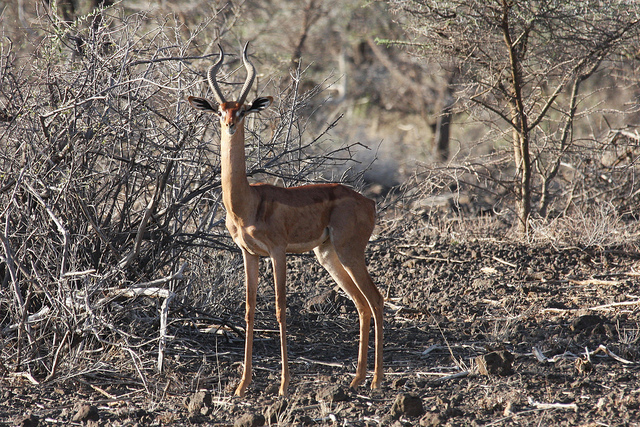 Stout, heavily ringed and deadly looking horns atop Bambi features – really quite exquisite. They are made for defending their territory, certainly. 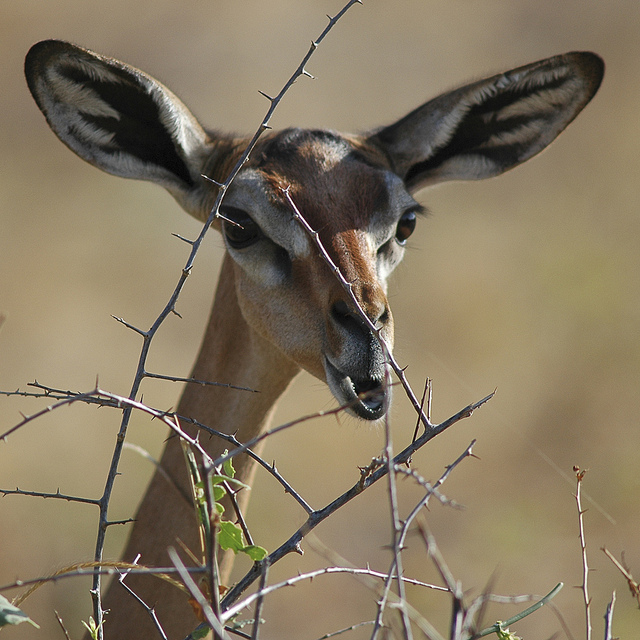 The GNA has pre-orbital glands by its eyes – and these bring forth a scent with the feel and look of tar which they use to mark bushes and other plants in order to set the boundaries of their territory. 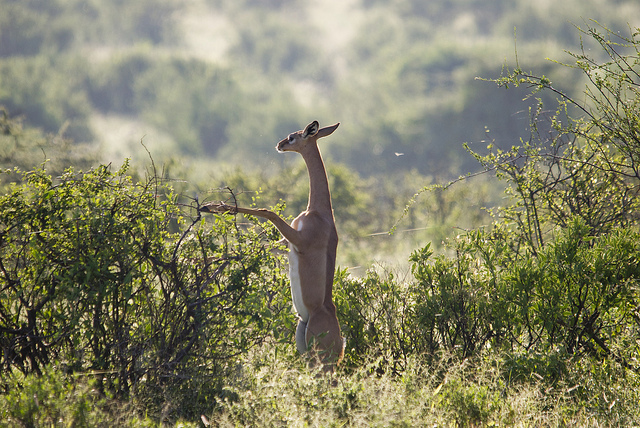 There are two other places where the GNA has scent glands – and these are in unusual places (or so we might thing). The first are situated on their knees and covered by hair, the other between the splits in their hooves. When alone and aloof the male can certainly give off an air of undisputed authority. This is despite the inclination of many to make ‘aw’ type noises (which is unique, incidentally, to the human race). The females like to give birth alone, like many animals. She goes to a quiet spot and then once the fawn has been delivered, licks it clean and eats the afterbirth. This may happen because she needs the nutrients but could also be because she doesn’t want any predators to sniff out her and her newborn. 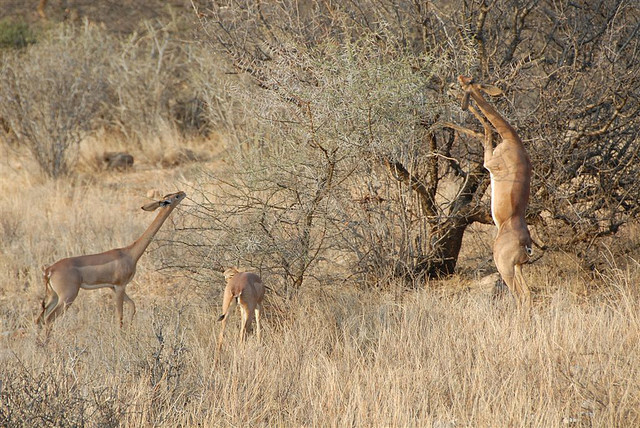 Unlike many grazing animals the GNA gives birth all year round – quite probably because its remarkable neck adaptation allows it to graze all seasons. If you really want an ‘aw’ moment, then take a look at these young GNAs. The ecosystem in which the GNA lives is complex and so it has evolved its own specialized niche within it. 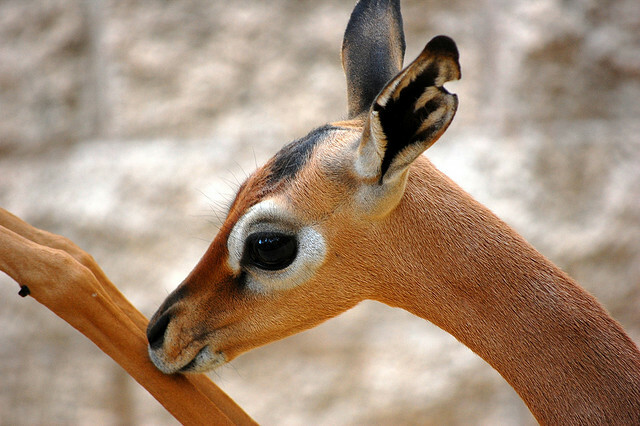 GNAs feed much higher than most other antelopes and gazelles. Standing on their tip toes (or tip hooves, which doesn’t sound as good but is more accurate) they can reach up to eight feet. 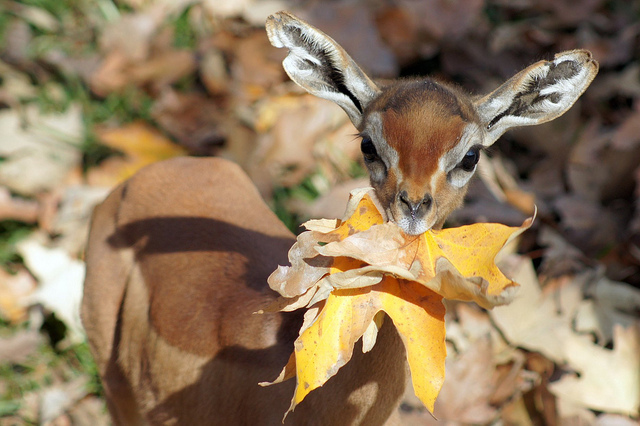 They will use their forelegs to pull down branches that are even higher than they are and can get to tender new leaves that other animals cannot. As a plus, the GNA does not need to drink water at all – it gets all the moisture it needs from the plants they devour. Their main threat does not come from other animals, however. Yes, you have guessed it – humanity is the greatest threat to the existence of the GNA. The continual encroachment by humans on to their territories means that the numbers of GNA, sadly and like so many other species, is decreasing.